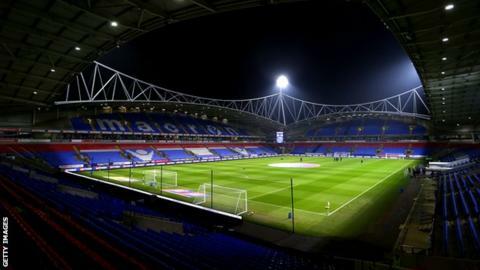 Bolton Wanderers players are refusing to train for 48 hours after staff were not paid their salaries on time for the second month in a row. BBC Radio Manchester reports that the players, who have not been paid either, are taking action on behalf of staff. On Wednesday, chairman Ken Anderson said the club could be sold "within 48 hours", however a deal is still yet to be done. Bolton are due to appear in the High Court on Wednesday over a £1.2m unpaid tax bill and other debts. Saturday's 2-1 win against QPR put Bolton to within five points of safety in 23rd place in the Championship, with seven games of the season remaining. Bolton Wanderers said they would not comment when contacted by the BBC.